This article is about the Toronto neighbourhood. For the nearby TTC subway station, see Eglinton West (TTC). 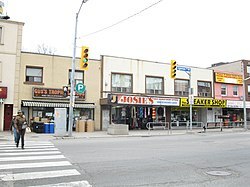 Eglinton West, also known as Little Jamaica, is an ethnic enclave in the York district of Toronto, Ontario, Canada. It is situated along Eglinton Avenue West, from Allen Road to Keele Street, and is part of four neighbourhoods: Silverthorn, Briar Hill–Belgravia, Caledonia–Fairbank, and Oakwood–Vaughan. There are a large number of Jamaican businesses along this strip. There are also businesses of other Caribbean/West Indian communities, including Trinidadian, Bajan, and Guyanese among others. The businesses along Eglinton Avenue West are frequented by many in the Greater Toronto Area's 177,000-plus Jamaican community. The area overlaps the York–Eglinton Business Improvement Area, which stretches from Marlee Avenue in the east to Chamberlain Avenue in the west (just west of Dufferin Street). The laneway behind storefronts on the south side of Eglinton was officially named "Reggae Lane" in 2014, in honour of its heritage as a hot spot for reggae in the 1970s and 1980s. ^ NHS Profile, Toronto, CMA, Ontario, 2011 Statistics Canada. Accessed on January 8, 2014.